Bayerische Motoren Werke AG ( ; English: Bavarian Motor Works), commonly known as BMW or BMW AG, is a German luxury automobile, motorcycle and engine manufacturing company founded in 1916. 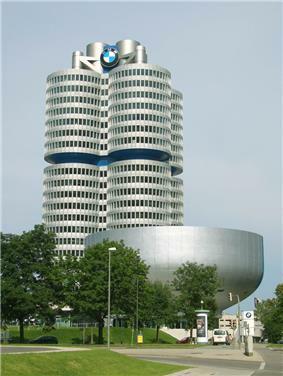 BMW is headquartered in Munich, Bavaria, Germany. It also owns and produces Mini cars, and is the parent company of Rolls-Royce Motor Cars. BMW produces motorcycles under BMW Motorrad, and plug-in electric cars under the BMW i sub-brand. BMW is one of the best-selling luxury automakers in the world. The company is a component of the Euro Stoxx 50 stock market index. BMW Isetta with a front opening door. BMW's first significant aircraft engine, and commercial product of any sort, was the BMW IIIa inline-six liquid-cooled engine of 1918, known for good fuel economy and high-altitude performance. With German rearmament in the 1930s, the company again began producing aircraft engines for the Luftwaffe. Among its successful World War II engine designs were the BMW 132 and BMW 801 air-cooled radial engines, and the pioneering BMW 003 axial-flow turbojet, which powered the tiny, 1944–1945–era jet-powered "emergency fighter", the Heinkel He 162 Spatz. The BMW 003 jet engine was first tested as a prime powerplant in the first prototype of the Messerschmitt Me 262, the Me 262 V1, but in 1942 tests the BMW prototype engines failed on takeoff with only the standby Junkers Jumo 210 nose-mounted piston engine powering it to a safe landing. The few Me 262 A-1b test examples built used the more developed version of the 003 jet, recording an official top speed of 800 km/h (497 mph). The first-ever four-engine jet aircraft ever flown were the sixth and eighth prototypes of the Arado Ar 234 jet reconnaissance-bomber, which used BMW 003 jets for power. Through 1944 the 003's reliability improved, making it a suitable powerplant for airframe designs competing for the Jägernotprogramm's light fighter production contract. which was won by the Heinkel He 162 Spatz design. The BMW 003 aviation turbojet was also under consideration as the basic starting point for a pioneering turboshaft powerplant for German armored fighting vehicles in 1944–45, as the GT 101. Towards the end of the Third Reich, BMW developed some military aircraft projects for the Luftwaffe, the BMW Strahlbomber, the BMW Schnellbomber and the BMW Strahljäger, but none of them were built. By the year 1958, the automotive division of BMW was in financial difficulties and a shareholders meeting was held to decide whether to go into liquidation or find an alternative. It was decided to carry by trying to cash in on the current economy car boom exploited so successfully by German ex-aircraft manufacturers such as Messerschmitt and Heinkel. BMW bought the rights to manufacture the Italian Iso Isetta. 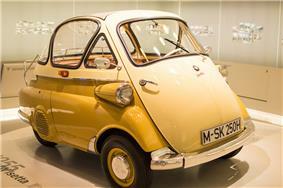 BMW's version of he tiny cars were to be powered by a modified form of BMW's motorcycle engine. This was moderately successful and helped the company get back on its feet. 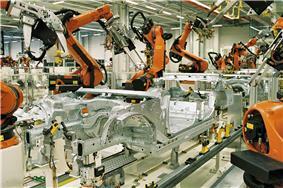 BMW plant in Leipzig, Germany: Spot welding of BMW 3 series car bodies with KUKA industrial robots. The BMW X3 (E83) was made by Magna Steyr, a subsidiary of Magna of Canada, in Graz, Austria under license from BMW until 2010. More than 45,973 were produced in 2009. Starting October 2010, the new BMW X3 (F25) is produced at BMW US Manufacturing Company, Greer, Spartanburg County, South Carolina. Vehicles sold in all markets according to BMW's annual reports. *Since 2008, motorcycle productions and sales figures include Husqvarna models. **Excluding Husqvarna, sales volume up to 2013: 59,776 units. BMW sells vehicles in China through "more than 440 BMW sales outlets and 100 Mini stores," delivering 415,200 units to this network between January and November 2014. BMW began production of motorcycle engines and then motorcycles after World War I. Its motorcycle brand is now known as BMW Motorrad. 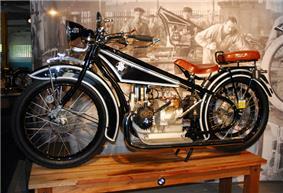 Their first successful motorcycle, after the failed Helios and Flink, was the "R32" in 1923. This had a "boxer" twin engine, in which a cylinder projects into the air-flow from each side of the machine. Apart from their single-cylinder models (basically to the same pattern), all their motorcycles used this distinctive layout until the early 1980s. Many BMWs are still produced in this layout, which is designated the R Series. During the Second World War, BMW produced the BMW R75 motorcycle with a sidecar attached. Having a unique design copied from the Zündapp KS750, its sidecar wheel was also motor-driven. Combined with a lockable differential, this made the vehicle very capable off-road, an equivalent in many ways to the Jeep. In 1982, came the K Series, shaft drive but water-cooled and with either three or four cylinders mounted in a straight line from front to back. Shortly after, BMW also started making the chain-driven F and G series with single and parallel twin Rotax engines. 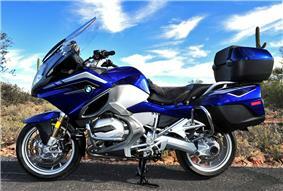 In the early 1990s, BMW updated the airhead Boxer engine which became known as the oilhead. In 2002, the oilhead engine had two spark plugs per cylinder. In 2004 it added a built-in balance shaft, an increased capacity to 1,170 cc and enhanced performance to 100 hp (75 kW) for the R1200GS, compared to 85 hp (63 kW) of the previous R1150GS. More powerful variants of the oilhead engines are available in the R1100S and R1200S, producing 98 and 122 hp (73 and 91 kW), respectively. In 2004, BMW introduced the new K1200S Sports Bike which marked a departure for BMW. It had an engine producing 167 hp (125 kW), derived from the company's work with the Williams F1 team, and is lighter than previous K models. Innovations include electronically adjustable front and rear suspension, and a Hossack-type front fork that BMW calls Duolever. BMW Group, on 31 January 2013 announced that Pierer Industrie AG has bought Husqvarna for an undisclosed amount, which will not be revealed by either party in the future. The company is headed by Stephan pierer (CEO of KTM). Pierer Industrie AG is 51% owner of KTM and 100% owner of Husqvarna. The New Class (German: Neue Klasse) was a line of compact sedans and coupes starting with the 1962 1500 and continuing through the last 2002s in 1977. Powered by BMW's celebrated four-cylinder M10 engine, the New Class models had a fully independent suspension, MacPherson struts in front, and front disc brakes. Initially a family of four-door sedans and two-door coupes, the New Class line was broadened to two-door sports sedans with the addition of the 02 Series 1600 and 2002 in 1966. Sharing little in common with the rest of the line beyond power train, the sporty siblings caught auto enthusiasts' attention and established BMW as an international brand. Precursors to the famed BMW 3 Series, the two-doors' success cemented the firm's future as an upper tier performance car maker. New Class four-doors with numbers ending in "0" were replaced by the larger BMW 5 Series in 1972. The upscale 2000C and 2000CS coupes were replaced by the six-cylinder BMW E9, introduced in 1969 with the 2800CS. The 1600 two-door was discontinued in 1975, and the 2002 was replaced by the 320i in 1975. The 1 Series, originally launched in 2004, is BMW's smallest car. Currently available are the second generation hatchback (F20) and first generation coupe/convertible (E82/E88). The 3 Series, a compact executive car manufactured since model year 1975, is currently in its sixth generation (F30); models include the sport sedan (F30), and fourth generation station wagon (F30), and convertible (E93), and the Gran Turismo. In 2014, the 4 Series has been released and replaced the 3 Series Coupe and Convertible. 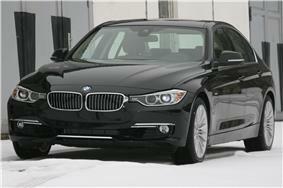 The 5 Series is a mid-size executive car, available in sedan (F10) and station wagon (F11) forms. The 5 Series Gran Turismo (F07), which debuted in 2010, created a segment between station wagons and crossover SUV. BMW's full-size flagship executive sedan is the 7 Series. Typically, BMW introduces many of their innovations first in the 7 Series, such as the iDrive system. The 7 Series Hydrogen, having one of the world's first hydrogen fueled internal combustion engines, is fueled by liquid hydrogen and emits only clean water vapor. The latest generation (F01) debuted in 2009. Based on the 5 Series' platform, the 6 Series is BMW's grand touring luxury sport coupe/convertible (F12/F13). A 2-seater roadster and coupe which succeeded the Z3, the Z4 has been sold since 2002. The X3 (F25), BMW's second crossover SUV (called SAV or "Sports Activity Vehicle" by BMW) debuted in 2010 and replaced the X3 (E83), which was based on the E46 3 Series' platform, and had been in production since 2003. Marketed in Europe as an off-roader, it benefits from BMW's xDrive all-wheel drive system. The all-wheel drive X5 (E53) was BMW's first crossover SUV (SAV), based on the 5 Series, and is a mid-size luxury SUV (SAV) sold by BMW since 2000. 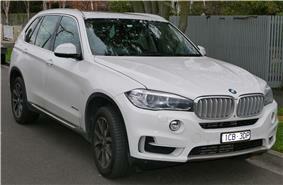 A 4-seat crossover SUV released by BMW in December 2007, the X6 is marketed as a "Sports Activity Coupe" (SAC) by BMW. The X1 extends the BMW Sports Activity Series model lineup. 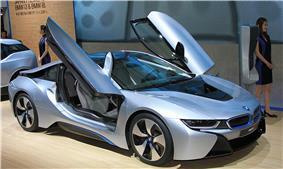 BMW i8 sports plug-in hybrid. The BMW i is a sub-brand of BMW founded in 2011 to design and manufacture plug-in electric vehicles. The sub-brand initial plans called for the release of two vehicles; series production of the BMW i3 all-electric car began in September 2013, and the market launch took place in November 2013 with the first retail deliveries in Germany. The BMW i8 sports plug-in hybrid car was launched in Germany in June 2014. As of June 2015, over 30,000 i brand vehicles have been sold worldwide since 2013, consisting of over 26,000 i3s and about 4,500 i8s. The all-electric BMW i3 ranked among the world's top ten best selling plug-in electric vehicles as of May 2015. Michael Dunlop won both the 2014 Senior and Superbike races on a 2014 BMW S1000RR. 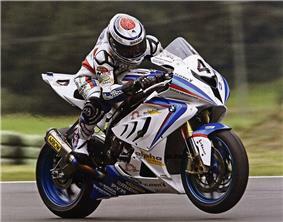 Superbike World Championship – BMW returned to premier road racing in 2009 with their all new superbike, the BMW S1000RR. 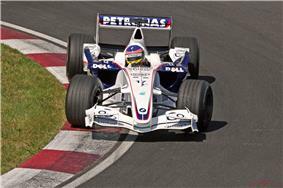 BMW was an engine supplier to Williams, Benetton, Brabham, and Arrows. Notable drivers who have started their Formula One careers with BMW include Jenson Button, Juan Pablo Montoya, Robert Kubica and Sebastian Vettel. Le Mans 24 Hours – BMW won Le Mans in 1999 with the BMW V12 LMR designed by Williams Grand Prix Engineering. Also the Kokusai Kaihatsu Racing team won the 1995 edition with a BMW-engined McLaren F1 GTR race car. Nürburgring – BMW won the 24 Hours Nürburgring 19 times and the 1000km Nürburgring twice (1976 and 1981). A BMW works team E36 320d was the first diesel-powered overall winner ever at the 24 Hours Nürburgring. American Le Mans Series – BMW has won three (2001, 2010, 2011) GT Team Championships and GT Automobile Manufacturer titles. Twice (2010, 2011) with Team RLL in the Crowne Plaza V8 powered M3 GT coupe and once (2001) with the BMW Motorsport team in the V8 powered M3 GTR. British Touring Car Championship (BTCC) – BMW won the drivers' championship in 1988, 1991, 1992 and 1993 and manufacturers' championship in 1991 and 1993. European Touring Car Championship (ETCC) – Since 1968, BMW won 24 drivers' championships along with several manufacturers' and teams' titles. SCCA Pro Racing World Challenge Touring Car Series(WC) – BMW won the manufacturer's championship in 2001 and Bill Auberlen, driving a Turner Motorsport BMW 325i, won the 2003 and 2004 Driver's Championships. World Touring Car Championship (WTCC) – BMW won four drivers' championship (1987, 2005, 2006 and 2007) and three manufacturers' titles (2005–2007). BMW announced on 15 October 2010 that it will return to touring car racing during the 2012 season. Dr. Klaus Draeger, director of research and development of the BMW Group, who was in charge of the return to DTM racing (Deutsche Tourenwagen Masters), commented that "The return of BMW to the DTM is a fundamental part of the restructuring of our motorsport activities. With its increased commitment to production car racing, BMW is returning to its roots. The race track is the perfect place to demonstrate the impressive sporting characteristics of our vehicles against our core competitors in a high-powered environment. The DTM is the ideal stage on which to do this." In football, BMW sponsors Bundesliga club Eintracht Frankfurt. It was an official sponsor of the London 2012 olympics providing 4000 BMWs and Minis in a deal made in November 2009. The company also made a six-year sponsorship deal with the United States Olympic Committee (USOC) in July 2010. In 2012, BMW Australia announced a 2-year sponsorship agreement with the Australian Film Institute’s Australian Academy of Cinema and Television Arts (AACTA) Awards. As part of the agreement, BMW supplied a fleet of vehicles renowned for appearing in feature films. The vehicles supplied included a range of elegant BMW limousines, iconic BMW’s of the past and the BMW 6 Series which featured in Mission Impossible 4: Ghost Protocol. The company is a charter member of the U.S. Environmental Protection Agency's (EPA) National Environmental Achievement Track, which recognizes companies for their environmental stewardship and performance. It is also a member of the South Carolina Environmental Excellence Program. In 2012, BMW was named the world's most sustainable automotive company for the eighth consecutive year by the Dow Jones Sustainability Indexes. The BMW Group is the only automotive enterprise in the index since its inception in 1999. In 2001, the BMW Group committed itself to the United Nations Environment Programme, the UN Global Compact and the Cleaner Production Declaration. It was also the first company in the automotive industry to appoint an environmental officer, in 1973. BMW is a member of the World Business Council for Sustainable Development. BMW is industry leader in the Carbon Disclosure Project's Global 500 ranking and 3rd place in Carbon Disclosure Leadership Index across all industries. BMW is listed in the FTSE4GoodIndex. The BMW Group was rated the most sustainable DAX 30 company by Sustainalytics in 2012. BMW has taken measures to reduce the impact the company has on the environment. It is trying to design less-polluting cars by making existing models more efficient, as well as developing environmentally friendly fuels for future vehicles. Possibilities include: electric power, hybrid power (combustion engines and electric motors) hydrogen engines. BMW has created a range of high-end bicycles sold online and through dealerships. They range from the Kid's Bike to the EUR 4,499 Enduro Bike. In the United States, only the Cruise Bike and Kid's Bike models are sold. BMW vehicles follow a certain nomenclature; usually a 3 digit number is followed by 1 or 2 letters. The first number represents the series number. The next two numbers traditionally represent the engine displacement in cubic centimeters divided by 100. However, more recent cars use those two numbers as a performance index, as e.g. the 116i, 118i and 120i (all 2,0L petrol-powered), just like the 325d and 330d (both 3,0L diesel) share the same motor block while adjusting engine power through setup and turbocharging. A similar nomenclature is used by BMW Motorrad for their motorcycles. For example, the BMW 750iL is a fuel-injected 7 Series with a long wheelbase and 5.4 litres of displacement. This badge was used for successive generations, E65 and F01, except the "i" and "L" switched places, so it read "Li" instead of "iL". When 'L' supersedes the series number (e.g. L6, L7, etc.) it identifies the vehicle as a special luxury variant, having extended leather and special interior appointments. The L7 is based on the E23 and E38, and the L6 is based on the E24. When 'X' is capitalised and supersedes the series number (e.g. X3, X5, etc.) 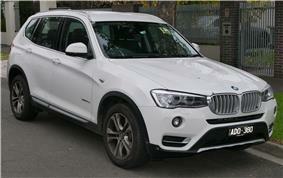 it identifies the vehicle as one of BMW's Sports Activity Vehicles (SAV), their brand of crossovers, with BMW's xDrive. The second number in the 'X' series denotes the platform that it is based upon, for instance the X5 is derived from the 5 Series. Unlike BMW cars, the SAV's main badge does not denote engine size; the engine is instead indicated on side badges. The 'Z' identifies the vehicle as a two-seat roadster (e.g. Z1, Z3, Z4, etc.). 'M' variants of 'Z' models have the 'M' as a suffix or prefix, depending on country of sale (e.g. 'Z4 M' is 'M Roadster' in Canada). Previous X & Z vehicles had 'i' or 'si' following the engine displacement number (denoted in litres). BMW is now globally standardising this nomenclature on X & Z vehicles by using 'sDrive' or 'xDrive' (simply meaning rear or all-wheel drive, respectively) followed by two numbers which vaguely represent the vehicle's engine (e.g. Z4 sDrive35i is a rear-wheel-drive Z4 roadster with a 3.0 L twin-turbo fuel-injected engine). BMW last used the 's' for the E36 328is, which ceased production in 1999. However, the 's' nomenclature was brought back on the 2011 model year BMW 335is and BMW Z4 sDrive35is. The 335is is a sport-tuned trim with more performance and an optional dual clutch transmission that slots between the regular 335i and top-of-the-line M3. The 'M' – for Motorsport – identifies the vehicle as a high-performance model of a particular series (e.g. M3, M5, M6, etc.). For example, the M6 is the highest performing vehicle in the 6 Series lineup. Although 'M' cars should be separated into their respective series platforms, it is very common to see 'M' cars grouped together as its own lineup on the official BMW website. The M version of the BMW 1 Series was named the BMW 1 Series M Coupe rather than the traditional style "M1" due to the possible confusion with BMW's former BMW M1 homologation sports car. The M versions of the Sports Activity Vehicles, such as the X5 M, could not follow the regular naming convention since MX5 was used for Mazda's MX-5 Miata. For instance in the 2008 model year, the BMW 125i/128i, 328i, and 528i all had 3.0 naturally aspirated engines (N52), not a 2,500 cc or 2,800 cc engine as the series designation number would lead one to believe. The '28' is to denote a detuned engine in the 2008 cars, compared to the 2006 model year '30' vehicles (330i and 530i) whose 3.0 naturally aspirated engines are from the same N52 family but had more output. The 2008 BMW 335i and 535i also have 3.0-litre engine; however the engines are twin-turbocharged (N54) which is not identified by the nomenclature. Nonetheless the '35' indicates a more powerful engine than previous '30' models that have the naturally aspirated N52 engine. The 2011 BMW 740i and 335is shares the same twin-turbo 3.0 engine from the N54 family but tuned to higher outputs, although the badging is not consistent ('40' and 's'). The 2013 BMW 640i Gran Coupe's twin-scroll single turbo 3.0L inline-6 engine makes similar output to the older twin turbo inline-6 engines. In June 2011, BMW and Sixt launched Drivenow, a joint-venture that provides carsharing services in several cities in Europe and North America. As of December 2012, DriveNow operates over 1,000 vehicles, which serve five cities worldwide and over 60,000 customers. BMW has developed street lights equipped with sockets to charge electric cars, called Light and Charge. From the summer of 2001 until October 2005, BMW hosted The Hire, showcasing sporty models being driven to extremes. These videos are still popular within the enthusiast community and proved to be a ground-breaking online advertising campaign. The initials BMW are pronounced in German. The model series are referred to as "Einser" ("One-er" for 1 series), "Dreier" ("Three-er" for 3 series), "Fünfer" ("Five-er" for the 5 series), "Sechser" ("Six-er" for the 6 series), "Siebener" ("Seven-er" for the 7 series). These are not actually slang, but are the normal way that such letters and numbers are pronounced in German. In the US, specialists have been at pains to  in the manner of a "true aficionado" and avoid appearing to be "uninitiated." The Canadian Globe and Mail prefers Bimmer and calls Beemer a "yuppie abomination," while the Tacoma News Tribune says it is a distinction made by "auto snobs." Using the wrong slang risks offending BMW enthusiasts. An editor of Business Week was satisfied in 2003 that the question was resolved in favor of Bimmer by noting that a Google search yielded 10 times as many hits compared to Beemer. Manufacturers employ designers for their cars, but BMW has made efforts to gain recognition for exceptional contributions to and support of the arts, including art beyond motor vehicle design. These efforts typically overlap or complement BMW's marketing and branding campaigns. BMW Headquarters designed in 1972 by Karl Schwanzer has become a European icon, and artist Gerhard Richter created his Red, Yellow, Blue series of paintings for the building's lobby. 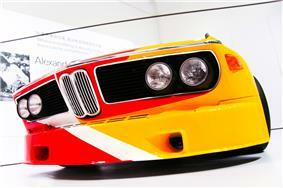 In 1975, Alexander Calder was commissioned to paint the 3.0CSL driven by Hervé Poulain at the 24 Hours of Le Mans. This led to more BMW Art Cars, painted by artists including David Hockney, Jenny Holzer, Roy Lichtenstein, and others. The cars, currently numbering 17, have been shown at the Louvre, Guggenheim Museum Bilbao, and, in 2009, at the Los Angeles County Museum of Art and New York's Grand Central Terminal. BMW was the principal sponsor of the 1998 The Art of the Motorcycle exhibition at the Solomon R. Guggenheim Museum and other Guggenheim museums, though the financial relationship between BMW and the Guggenheim was criticised in many quarters. In 2012, BMW brought out the BMW Art Guide by Independent Collectors, which had, amongst others, the Dikeou Collection. It is the first global guide to private and publicly accessible collections of contemporary art worldwide. The 2006 "BMW Performance Series" was a marketing event geared to attract black car buyers, and included the "BMW Pop-Jazz Live Series," a tour headlined by jazz musician Mike Phillips, and the "BMW Blackfilms.com Film Series" highlighting black filmmakers. On October 9, 2014, BMW's new South American automobile plant in Araquari, Santa Catarina produced its first car. 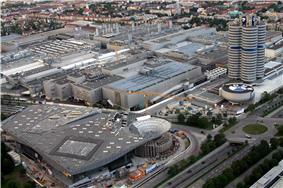 BMW intend to increase its production capacity to over 30,000 vehicles a year. The new site is intended to create around 1,300 new jobs, of which 500 have already been filled. Signing a deal in 2003 for the production of sedans in China, May 2004 saw the opening of a factory in the North-eastern city of Shenyang where Brilliance Auto produces BMW-branded automobiles in a joint venture with the German company. BMW India was established in 2006 as a sales subsidiary in Gurgaon (National Capital Region). A state-of-the-art assembly plant for BMW 3 and 5 Series started operation in early 2007 in Chennai. Construction of the plant started in January 2006 with an initial investment of more than one billion Indian Rupees. The plant started operation in the first quarter of 2007 and produces the different variants of BMW 3 Series, BMW 5 Series, BMW 7 Series, BMW X1, BMW X3, Mini Cooper S, Mini Cooper D and Mini Countryman. In July 2014 BMW announced it was establishing a plant in Mexico, in the city and state of San Luis Potosi involving an investment of $1 billion. Taking advantage of lower wages in the country, and the terms of free trade agreements Mexico has with a host of other countries, were the motivating factors the company said. The plant will employ 1,500 people, and produce 150,000 cars annually, commencing in 2019. BMWs have been assembled in South Africa since 1968, when Praetor Monteerders' plant was opened in Rosslyn, near Pretoria. BMW initially bought shares in the company, before fully acquiring it in 1975; in so doing, the company became BMW South Africa, the first wholly owned subsidiary of BMW to be established outside Germany. Three unique models that BMW Motorsport created for the South African market were the E23 M745i (1983), which used the M88 engine from the BMW M1, the BMW 333i (1986), which added a six-cylinder 3.2-litre M30 engine to the E30, and the E30 BMW 325is (1989) which was powered by an Alpina-derived 2.7-litre engine. BMWs with a VIN starting with "NC0" are manufactured in South Africa. The BMW Manufacturing Company opened in 1994 and has been manufacturing all Z4 and X5 models, and more recently the X6 and X3, including those for export to Europe, on the same assembly line in Greer near Spartanburg. In an average work day the company builds 600 vehicles: 500 X5s and 100 Z4s. The engines for these vehicles are built in Munich, Germany. BMWs with a VIN starting with "4US and 5US" are manufactured at Spartanburg. 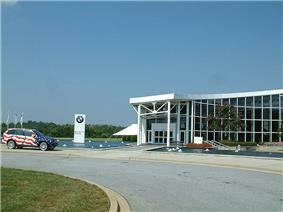 In 2010 BMW announced that it would spend $750 million to expand operations at the Greer plant. This expansion will allow production of 240,000 vehicles a year and will make the plant the largest car factory in the United States by number of employees. BMW's largest single market is the United States. Currently, the facility produces all BMW X3, X4, X5, X5 M, X6 and X6 M models. BMW began using the slogan 'The Ultimate Driving Machine' in the 1970s. In 2010, this long-lived campaign was mostly supplanted by 'Joy', a campaign intended to make the brand more "approachable" and to better appeal to women, but by 2012 they had returned to "The Ultimate Driving Machine", which has a strong public association with BMW. In 2013, BMW replaced the 'double-gong' sound used in TV and Radio advertising campaigns since 1998. The new sound, developed to represent the future identity of BMW, was described as "introduced by a rising, resonant sound and underscored by two distinctive bass tones that form the sound logo's melodic and rhythmic basis." The new sound was first used in BMW 4 Series Concept Coupe TV commercial. The sound was produced by Thomas Kisser of HASTINGS media music. The circular blue and white BMW logo or roundel evolved from the circular Rapp Motorenwerke company logo, from which the BMW company grew, combined with the blue and white colors of the flag of Bavaria. The logo has been portrayed as the movement of an aircraft propeller with the white blades cutting through a blue sky—first used in a BMW advertisement in 1929, twelve years after the roundel was created—but this is not the origin of the logo itself. The colors of the logo stands for the colors from the south part state of Beieren. In 2012, BMW vehicles were stolen by programming a blank key fob to start the car through the on-board diagnostics (OBD) connection. The primary causes of this vulnerability lie in the lack of appropriate authentication and authorization in the OBD specifications, which rely largely on security through obscurity. BMW uses the same symmetric keys in all cars. some services do not encrypt transported data while connecting to the BMW backend. the integrity of the ConnectedDrive configuration is not protected. the Combox discloses the vehicle identification number via NGTP (next generation telematics pattern) error messages. data sent via SMS in NGTP format are encryped via the nowadays unsecure DES. the Combox does not protect against replay attacks. 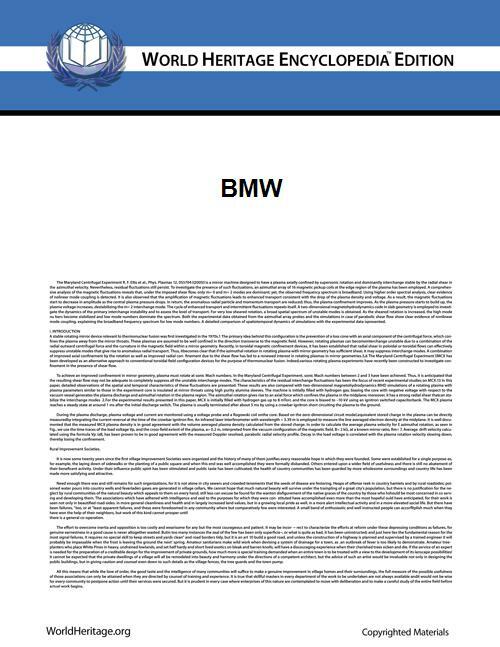 BMW was notified in advance of the publication to provide fixes. The transport is now encrypted and BMWs server certificate is verified. The updates were delivered via ConnectedDrive config change. All BMW, Mini and Rolls Royce cars produced between March 2010 and 8 December 2014 are vulnerable. Cars without battery or parked in places without mobile connection still may be vulnerable, an update can be initiated manually. .BMW - A new generic top level domain name purchased by BMW. ^ Peter Gantriis, Henry Von Wartenberg. "The Art of BMW: 85 Years of Motorcycling Excellence". MotorBooks International, September 2008, p. 10. ^ A total of 26,205 i3s and 4,456 i8s have been sold worldwide through June 2015. ^ http://news.bbc.co.uk/1/hi/business/6154212.stm BMW's hydrogen car: Beauty or beast? ^ Auto, öffne dich! Sicherheitslücken bei BMWs ConnectedDrive, c't, 2015-02-05.